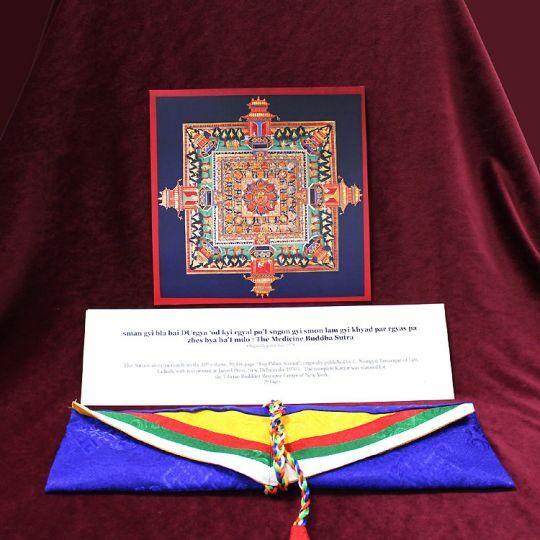 The Medicine Buddha Ritual Set for Pujas allows students to better fulfill Lama Zopa Rinpoche’s advice regarding how to perform Medicine Buddha pujas, taught as being powerful rituals for success and to benefit the dying, sick, and dead. The Medicine Buddha Sutra, or Sutra of the Extensive Qualities of the Previous Vaidurya Light Prayers of the Bhagavan Medicine Guru, recounts the twelve aspirational prayers made by Medicine Buddha in his past lives that came to fruition through the force of his enlightenment. The sutra also recounts the great benefits of Medicine Buddha practice, such as those of reciting and hearing his name. 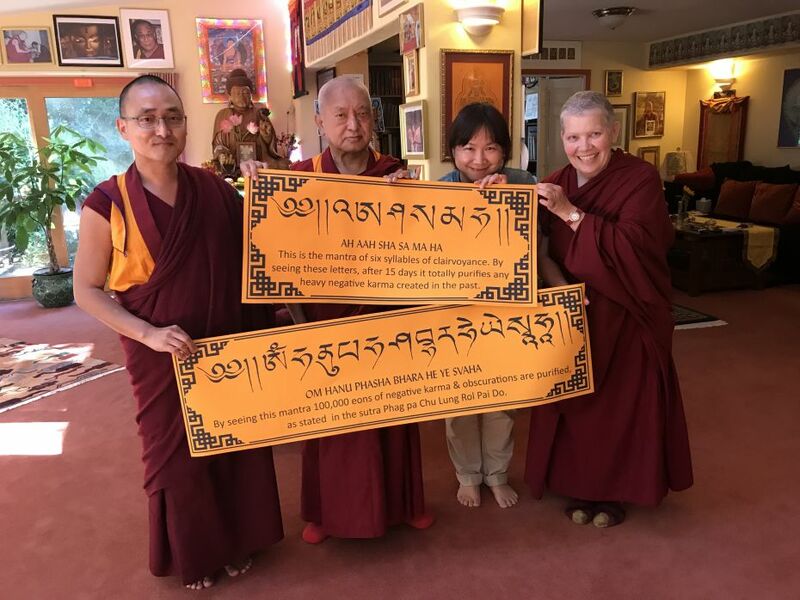 Lama Zopa Rinpoche, Buddha Amitabha Pure Land, Washington, US, June 2018. Photo by Ven. Lobsang Sherab. Lama Zopa Rinpoche recently offered some new advice about lunar and solar eclipses, which are considered auspicious days for practice and provide opportunities for accumulating increased merit. In addition to Lama Zopa Rinpoche reminding students that the merit generated on lunar eclipses is multiplied by 700,000 and by 100 million on solar eclipses, Rinpoche taught that the multiplying effect of eclipses occurs whether the eclipse is partial or full. Also, Rinpoche advised that the merit multiplying effect does not last the whole calendar day and that merit making activities should be carried out during the time of the eclipse itself. Whether or not an eclipse is occurring and its exact timing depends on where a student is on Earth. Websites like timeanddate.com can help students determine if and when there is an opportunity to practice during an eclipse. 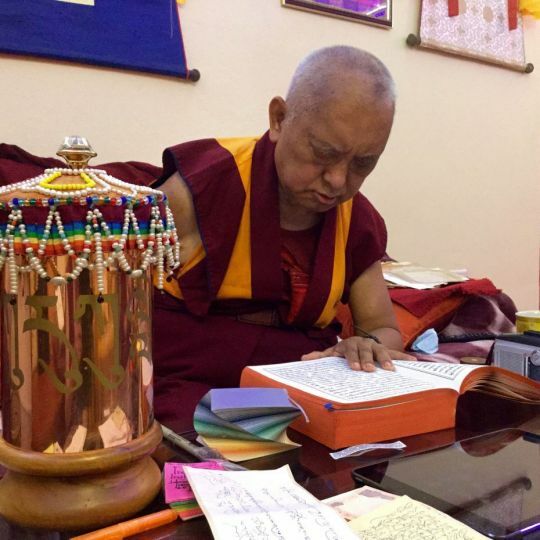 Any other meritorious activities advised by Lama Zopa Rinpoche are also good to do on these days, such as recitation of the Vajra Cutter Sutra, the Sutra of Golden Light, and the Sanghata Sutra, with extensive dedications. These texts are available on the “Sutras” page on FPMT.org. July 27 is possibly a lunar eclipse in your part of the world! All are encouraged to use a website like timeanddate.com to determine if and when one might participate in generating 700,000 times the merit than what would be accumulated on a non-multiplying day. 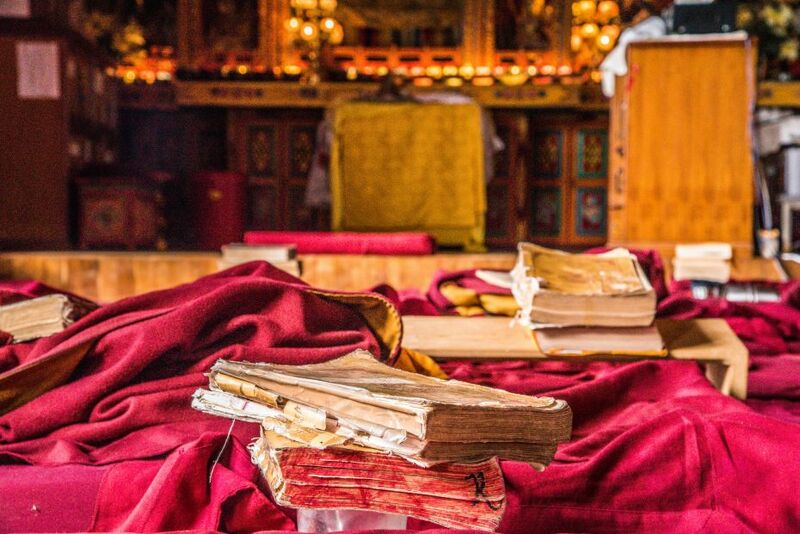 Practice books, Kopan Monastery, Nepal, March 2017. Photo by Ivan Siarbolin. As the Dharma takes root in the West, the FPMT organization needs to follow in the footsteps of these bodhisattvas and provide clear and accurate translations of the classic Tibetan texts in modern world languages. 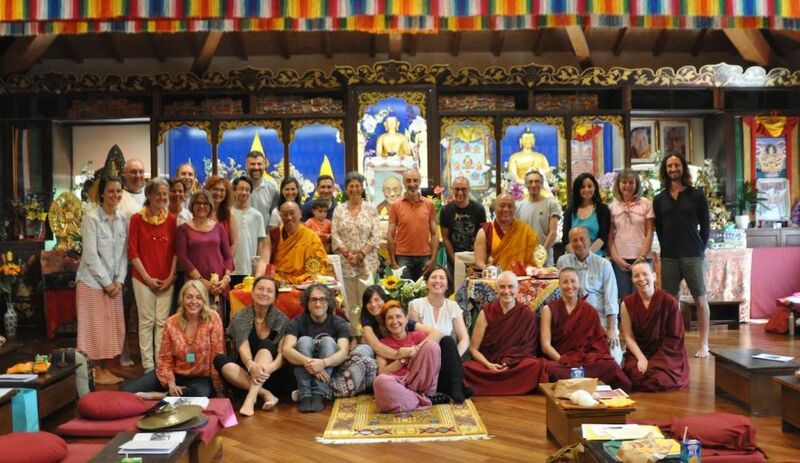 The FPMT Translation Fund supports this work. Translations have already been completed in English, French, Spanish, German, Italian, Portuguese, Chinese, and Mongolian. FPMT Translation Fund sponsorships have helped translate Dharma texts and commentaries that have been crucial for successful study in FPMT in-depth education programs and for students and centers to be able to follow practice advice from Lama Zopa Rinpoche. These translations include prestigious works such as Lama Tsongkhapa’s Middle Length Lamrim into English and German and his Lamrim Chenmo into Chinese; Gyaltsab Je’s Ornament of the Essence, with Maitreya’s root verses and the Indian commentary by Haribhadra, into English; and sutras such as the Sanghata Sutra and the Sutra of Golden Light into many modern languages. Benefactors and supporters are always needed for new projects. Several commentaries critical to the development of FPMT’s Masters Program and Basic Program—now offered in several languages—are in progress of being commissioned; and the translation of the 29-chapter edition of the Sutra of Golden Light into English is also in the advanced stages of planning. If you would like to help make the Dharma accessible to practitioners and students around the world, we welcome and appreciate donations of any amount. Thank you so much for your support! 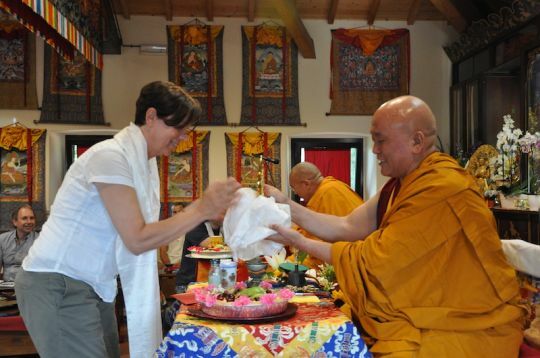 On June 10, 2018, several students from Istituto Lama Tzong Khapa’s 2015-2018 Basic Program met to offer a thanksgiving puja to mark the conclusion of their program. From among the thirty-five students who participated in the three-month review and passed the final exam, thirteen have already graduated, while another twenty have plans in place to fulfill their completion requirement of a month-long lamrim retreat this year. The vast majority of students participated in the program online, an impressive achievement considering how difficult it can be for students to complete multi-year online programs! The ceremony was an opportunity to present offerings and give thanks to Geshe Tenphel and Geshe Gelek, the teachers of Istituto Lama Tzong Khapa’s third Basic Program; to institute staff; and to all those who maintain the excellent quality of the FPMT in-depth education programs. Registration is open for the fourth round of the residential and online Basic Program at Istituto Lama Tzong Khapa, taking place September 2018 through June 2022. Completing individual subjects is also possible. For more information and to register, please visit Istituto Lama Tzong Khapa’s Basic Program 2018-2022. His Holiness the Dalai Lama, Ladakh, India, July 2014. Photo by Olivier Adam. 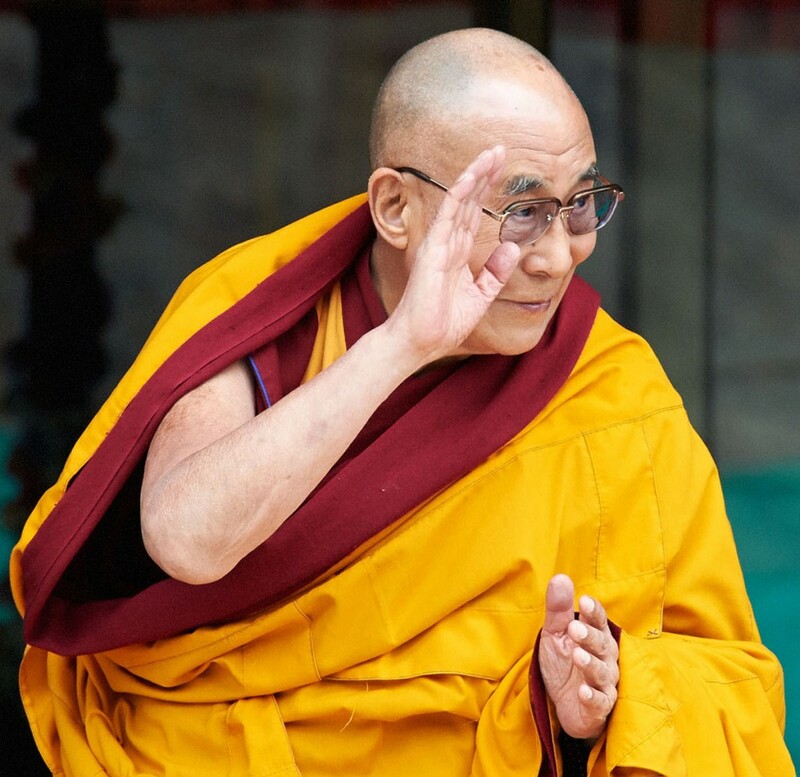 On July 6 the world will celebrate His Holiness the Dalai Lama’s 83rd birthday. Enjoy these many resources available to help celebrate, praise, and learn from His Holiness! “Long Life Prayers for His Holiness Dalai Lama” was composed by the late tutors to His Holiness the Dalai Lama, His Holiness Ling Rinpoche and His Holiness Trijang Rinpoche. Translated by Gelongma Khechog Palmo in Rumtek, Sikkim. “Remembering the Kindness of His Holiness the Dalai Lama and the Tibetan People” was composed by Lama Zopa Rinpoche especially for the success of His Holiness’s wishes, and in particular for the Tibetan people, and for there to be perfect peace and happiness in the world and for all sentient beings to achieve enlightenment. 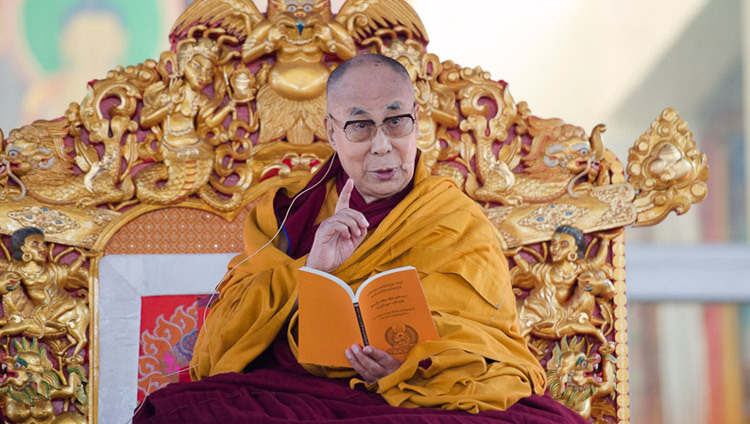 “Praises and Requests to His Holiness the Dalai Lama” is a collection of praises, comments, and requests by Lama Zopa Rinpoche concerning His Holiness available in the Lama Yeshe Wisdom Archive Online Advice Book. The Foundation Store offers a number of books by His Holiness, including his most recent book co-authored with Ven. Thubten Chodron, The Foundation of Buddhist Practice, published by Wisdom Publications. When His Holiness was nineteen years old, he composed a Chenrezig guru yoga sadhana titled The Inseparability of the Spiritual Master and Avalokiteshvara. The practice includes visualizations that inspire the development of compassion and wisdom and is included in Becoming the Compassion Buddha by Lama Yeshe. FPMT Education Services wishes His Holiness a very auspicious 83rd birthday and sincerely requests His Holiness to live for a very long time to continue bringing his universal message of compassion to the world. His Holiness the Dalai Lama explaining a text on the first day of his teachings at the Kalachakra Maidan in Bodhgaya, Bihar, India on January 5, 2018. Photo by Lobsang Tsering, courtesy DalaiLama.com. Lama Zopa Rinpoche and Khadro-la (Rangjung Neljorma Khadro Namsel Drönme) at a picnic at the base camp of trail to Thaktsang Monastery, Bhutan, May 2016. Photo by Ven. Roger Kunsang. In 2016, Khadro-la (Rangjung Neljorma Khadro Namsel Drönme) spontaneously composed a prayer for Lama Zopa Rinpoche, which was offered during a long life puja for Rinpoche held March 13, 2016, at Amitabha Buddhist Centre in Singapore. 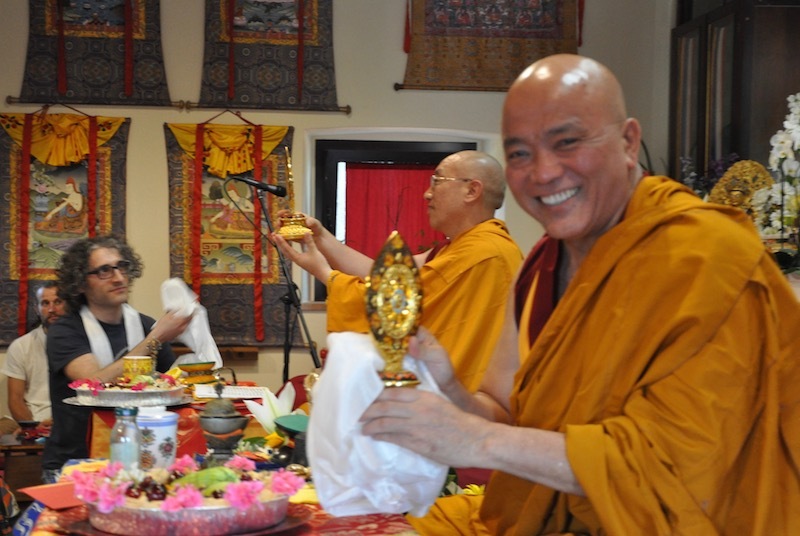 The English translation of the prayer was read for all to hear while Rinpoche received the prayer in Tibetan. Students can find the prayer translated from Tibetan into Chinese, English, German, Italian, and Spanish. Also, students can find tunes for the Tibetan-language version, created by Bhutanese musicians Pema Samdrup and Pema Lhamo. Lama Zopa Rinpoche asked that these recordings be played at big retreats during break times or while students are waiting in the gompa. He also asked that both or either of these tunes be learned and used when offering the prayer. Recently, audio and video recordings of Vens. 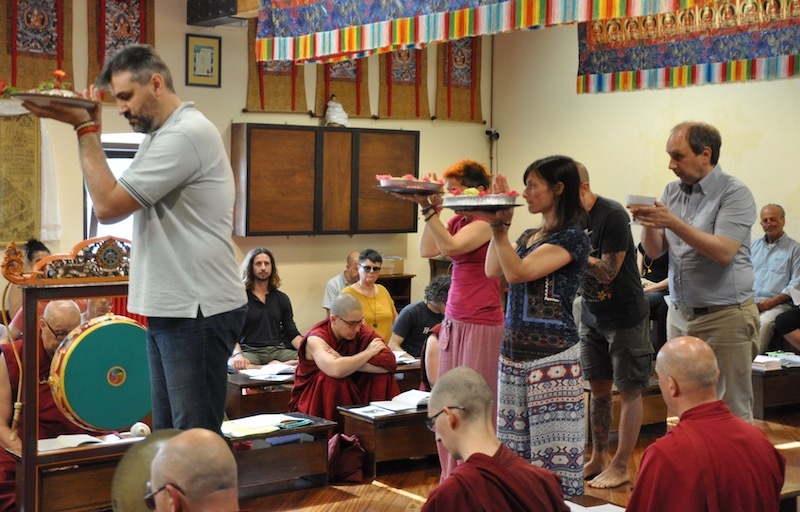 Dechen and Gyalten were made during the Bodhicaryavatara and Rinjung Gyatsa Retreat at the Great Stupa of Universal Compassion in Benidgo, Australia, to help facilitate students learning the tune. We invite all students of Rinpoche to learn the tune as quickly as possible. In the Living in the Path module “Bringing Emptiness to Life,” Lama Zopa Rinpoche gives detailed and very clear teachings on the extremely important subject of emptiness, the realization of which is necessary to achieve both liberation from samsara and full enlightenment. In this introductory video to the module, Don Handrick gives a clear and comprehensive presentation of the subject of emptiness, which according to the Madhyamaka Prasangika, the highest school of Buddhist philosophy, refers to the lack of true existence of the self and all phenomena. 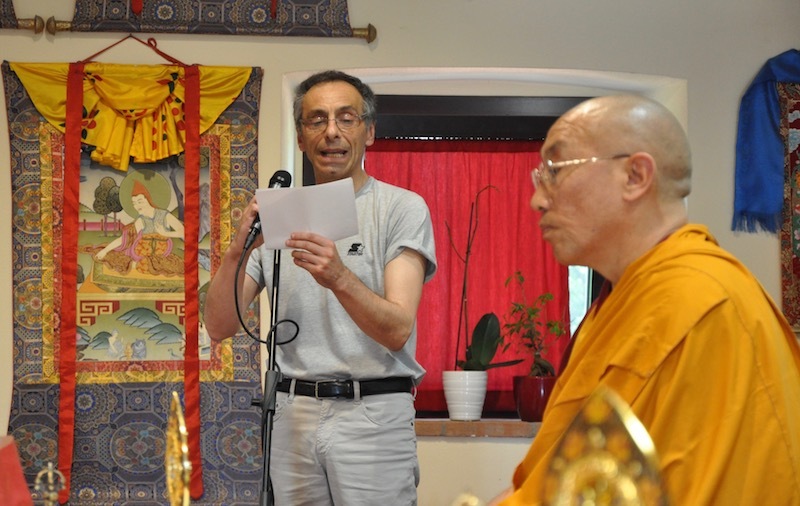 Don Handrick is a graduate of the first FPMT Masters Program 1998-2004. Since 2006, he has been the resident teacher at Thubten Norbu Ling Buddhist Center in Santa Fe, New Mexico. 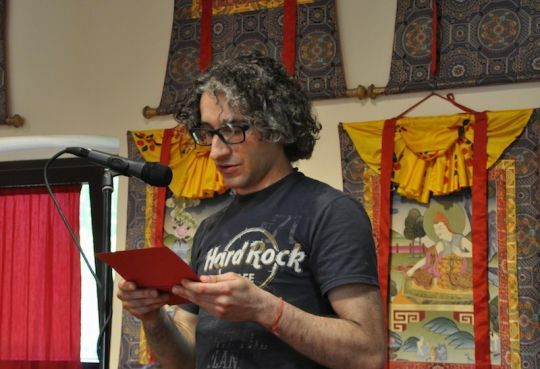 He also teaches regularly at the Ksitigarbha Tibetan Buddhist Center in Taos, and also serves as a Buddhist teacher in a local prison for Liberation Prison Project. 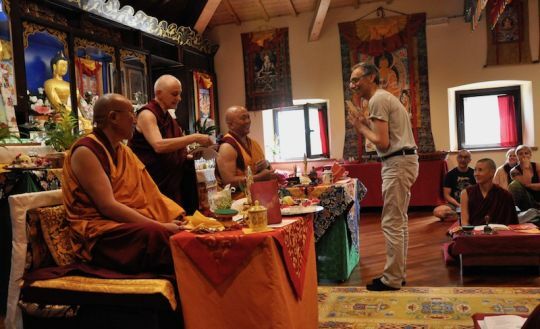 In 2015, he led the month-long November course at Kopan Monastery and, in 2016, he began spending a part of each year visiting other FPMT centers as a touring teacher. Don is an FPMT registered teacher. Service as a Path to Enlightenment, available in ebook formats through the Foundation Store, is a compilation of two letters—“Cultivating a Skillful Attitude” and “Leading with the Mind of a Servant”—dictated by Lama Zopa Rinpoche for FPMT staff members concerning how to make working for an FPMT center, project, or service the best kind of service. Any student can benefit from reading this text. “At the Dharma center, we should generate this motivation in the morning after we wake up, wherever we are—in our bed or on a chair,” Lama Zopa Rinpoche writes. “From that time until we die, but especially on that day, we should think: ‘This is how I’m going to think about everybody at the center—the staff and the visitors: “Everyone is most precious, dear and kind.” I’m going to practice this.’ This is what makes our life most happy and joyful. Wow! “Our heart and all our actions change and we respect everybody. We have good manners and sweet words, and every single action of our body, speech, and mind is respectful. We want to help others, naturally, with deep interest. We don’t get bothered and we are unbelievably happy to help. “Working at the center is for all sentient beings and especially to spread Dharma—the most important thing that others need to free them from suffering and bring them to enlightenment. That’s our motivation for working at the center with all the staff and visitors. If we keep our mind on this, it’s fantastic and we’re doing the best Dharma practice. Lama Zopa Rinpoche with Ven. Lobsang Sherab, Monica Hung, and Ven. Carol Corradi with mantra posters, Aptos, California, US, June 2017. Photo by Ven. Roger Kunsang. FPMT Education Services’ mantra resource page on FPMT.org offers students many commonly used mantras for their personal use. Recently added are the Just by Seeing Mantras—the Phagpa Chulung Rolpai Do Mantra and the Six Syllables of Clairvoyance Mantra, which are only necessary to be seen by sentient beings to have benefit. Mantras, meaning “mind protection,” are Sanskrit syllables, usually recited in conjunction with the practice of a particular meditational deity, and embody the qualities of the deity with which they are associated. Some mantras are so powerful that they are said to be able to benefit others even when no virtuous motivation is present. Extensive advice from Lama Zopa Rinpoche about the benefits of reading, writing, or reciting particular mantras, or how to engage with mantras to eliminate or reduce potential or ongoing obstacles, is available on FPMT.org’s Advice from Lama Zopa Rinpoche and Lama Yeshe Wisdom Archive’s Lama Zopa Rinpoche’s Online Advice Book pages. Lama Zopa Rinpoche writing out a mantra, Buddha Amitabha Pura Land, Washington, US, September 2016. Photo by Ven. Losang Sherab. 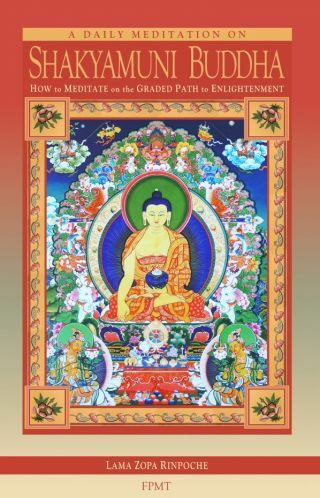 A Daily Meditation on Shakyamuni Buddha, specifically compiled by Lama Zopa Rinpoche for beginner Buddhist practitioners, is now available in print from the Foundation Store. 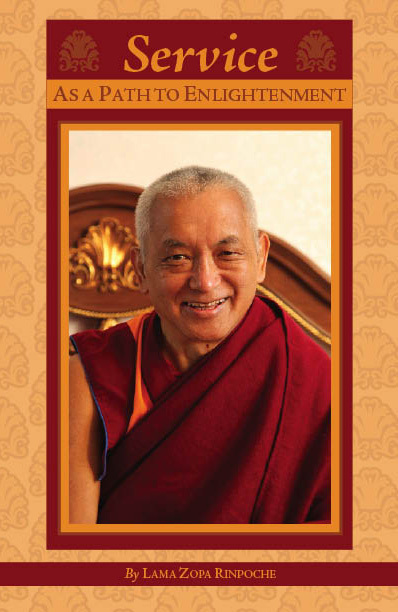 Last year, Lama Zopa Rinpoche reviewed and updated the previous edition with the help of Ven. Ailsa Cameron, a long-time editor for Lama Yeshe Wisdom Archive. 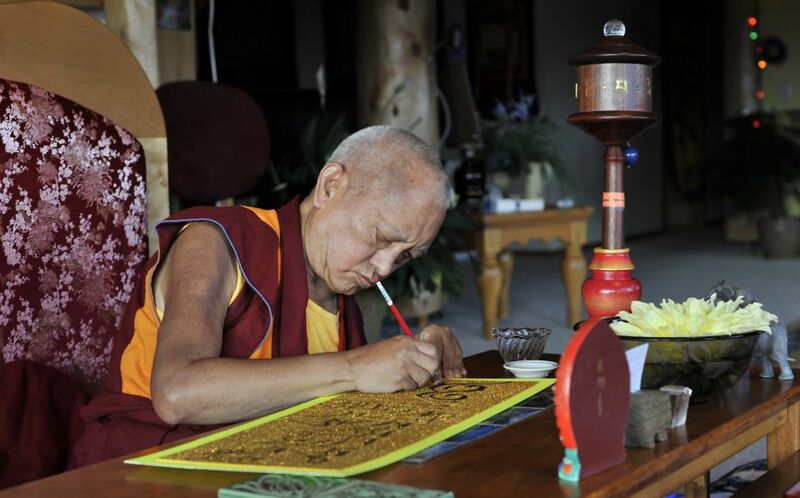 Lama Zopa Rinpoche reorganized many of the prayers based on his current way of doing them and, in particular, added an extensive explanation of the visualizations to be done while taking refuge. Drawn from Phabongkha Rinpoche’s Liberation in the Palm of Your Hand, for each of the objects of refuge—Guru, Buddha, Dharma, and Sangha—there are visualizations for purifying negative karma, increasing qualities, and coming under the guidance of that object of refuge. Subtitled “How to Meditate on the Graduated Path to Enlightenment,” the practices contained in this booklet prepare the mind for lamrim meditation by purifying negative karma and collecting extensive merit—the two main causes for attaining realizations. This practice can also be used as a basis for engaging in the preliminary practices of accumulating 100,000 prostrations, mandala offerings, and so forth. The Method to Transform a Suffering Life into Happiness (Including Enlightenment) with Additional Practices is now available in print from the Foundation Store. Lama Zopa Rinpoche has said very strongly on many occasions that this is a practice that he would like all his students to do every day. In this updated edition of the practice, the sections “Blessing the Speech” and “Daily Mantras” have been revised based on Rinpoche’s commentaries and the original Tibetan texts from which they are drawn. A new section—“Mantras for Specific Occasions”—includes mantras for increasing the power of sutra recitations and for blessing the feet and the wheels of a car. All the mantras in this edition have been written using a modified version of the International Alphabet of Sanskrit Transliteration (IAST) system that accords with the way Rinpoche would like these specific mantras pronounced. 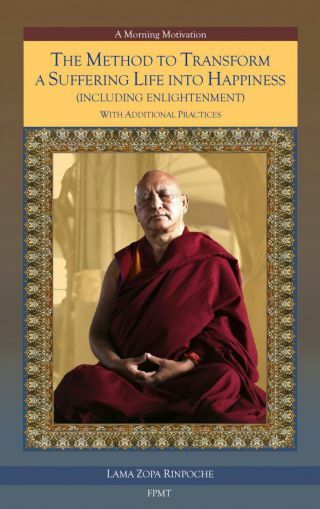 In addition, the many oral commentaries that Rinpoche has given on this practice have now been compiled and edited into an ebook—The Method to Transform a Suffering Life into Happiness (Including Enlightenment) with Additional Practices: A Commentary—to help students do these practices in the most meaningful way possible. In the commentary, Rinpoche explains how and why it is important to transform our life into Dharma by generating a bodhichitta motivation. In the commentaries to “Blessing the Speech,” “Daily Mantras,” and “Mantras for Specific Occasions,” Rinpoche explains the benefits of doing these practices and how to do them. We hope the commentaries will help inspire all of Rinpoche’s students to take up these practices in their daily lives!